Live in Glencoe, Illinois and looking for a ghostwriter to write your autobiography? Milestones, the Gift of a Lifetime can help. Get the help you need to write your personal memoirs. 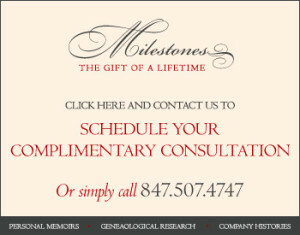 Find out more about Milestones and personal history services in Glencoe, IL 60022. Is it a tale of ancestors coming to America? Building a business? Or a collection of family stories? Future generations will treasure the knowledge of their family history. Milestones, the Gift of a Lifetime (www.YOURMILESTONES.net) will preserve your words in a professionally edited account of your life. Bonnie Bell, MSJ, M.Ed, MSJ, M.Ed, founder of Milestones, the Gift of a Lifetime and a North Shore native, has been helping clients write their life stories since 1999. Skilled in the art of interviewing, she is a published journalist with broad experience in writing life stories at People Magazine for more than 20 years. Writing your life story is easy, fun, and rewarding.